If you are a collector of rare sports autographs, you know the importance of buying from a reputable source and having the autograph authenticated. For sports autograph collectors, dreams are made of adding a rare autograph of a favorite sports figure to their collection. However, for many collectors these autographs are priced far out of their collecting budgets. Ranging in price from several hundred to several hundred thousand dollars, rare autographs of sports celebrities are highly coveted collectibles. Considered an expert in the field of autograph authentication, Kevin Keating, is also a world renowned buyer and seller of rare autographs in the sports field. 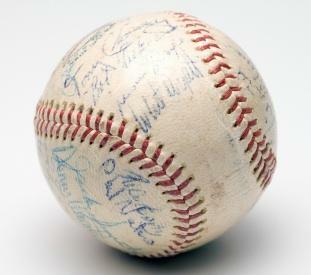 A baseball signed by Babe Ruth circa 1947. A boxing glove signed by Muhammad Ali. 500 home run club baseball, with 11 signatures including Mickey Mantle. When adding to a rare autograph collection, the reputation and reliability of the seller is of extreme importance. If the seller is a professional sports memorabilia and autograph dealer make certain there is an unconditional lifetime guarantee of the autograph's authenticity. Ask the dealer for third party references and take the time to research. Generally collectors build a relationship with dealers over time; it is up to the buyer to make sure he is dealing with a trustworthy, experienced expert. Unless you have seen the signature being hand signed by the sports celebrity, which is known as self authentication, having an autograph authenticated is of paramount importance. The leading sports autograph authentication company is PSADNA. Pooling the top experts in the field of sports autographs, each autograph is authenticated using a strict four step authentication process. Analysis of the medium and ink used. Analysis of the structure of the autograph. An evaluation of the object. Comparisons to other signatures by the celebrity. Using a video spectral comparator which detects erasures, ink differences, signatures that are masked or hidden and many other forms of tampering. Tagging, both covert and overt, is applied as a measure against counterfeiting. A certificate of authenticity is issued. Documentation of the certification is listed online for reference. The sports autograph market is estimated to be between $750 million to $1 billion each year. Sadly, it is also estimated that approximately 60 to 90 percent of the autographs are forgeries. Collectors of sports autographs need to protect themselves from being fooled by unscrupulous criminals that make a living selling forgeries. These scam artists prey on unsuspecting collectors and use various methods to produce and market their goods.The Internet has allowed collectors to locate authentic sports autographs that would have been unavailable to them in earlier years. However, in reality, it also makes it easier for many fraudulent transactions to take place. It is estimated that up to ninety percent of sports autographs on sites such as Ebay are not authentic signatures. Signings Hot Line lists every past and upcoming signing appearance made by present day and retired athletes. With almost 1400 sports figures listed, this is an invaluable resource for autograph collectors giving them a way to check that a signing actually took place at a specific event. Collectors also can find where there sports idols will be signing in the future. The world's largest collectibles auctioneer, Heritage Auction Galleries has broken auction price records in sports autographs and memorabilia. Whether your favorite sports autographs are baseball, hockey, football or basketball players, cyclists, or race car drivers, collecting rare sports autographs is an exciting hobby for many sports collectors.